Big interior, big mileage, big value... small price! 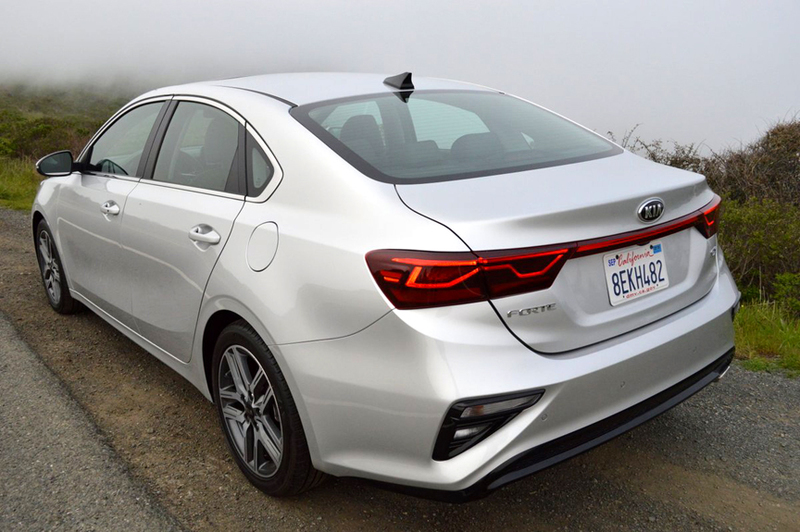 If you appreciate Korean automotive technology, you're going to love the completely revamped 2019 Kia Forte EX. With the introduction of its game changing Stinger in 2018, Kia proved that it is capable of building a world class, cutting edge sports coupe. Now, much of the $41,000 Stinger's bravura technology has filtered down to the more affordable, all new Forte EX, which carries a base price of just $21,990. To my eyes, the sleek Forte is even better looking than the somewhat ungainly Stinger. The Forte's classical low nose/high tail stance gives you the impression that it's ready to pounce on slower traffic. That visual impression is slightly misleading, however, since the only engine offered for 2019 is the base motor offered in 2018: a 2.0 liter inline 4 making 147hp and 132lb.-ft. of torque. Unfortunately, previously offered optional engines (164hp and a 201hp turbo) are no longer available in the Forte. But even with the base motor, the Forte EX is still a surprising kick to drive, thanks to its low curb weight of 2,805lbs. and manually controllable "Intelligent Variable Transmission." This IVT is one of the better CVT offerings. When you snap the floor lever into its manual range, you immediately shift the Forte into "Sport" mode. You can also access Sport via a Mode button on the center console. Choosing Sport illuminates a red outline of the Forte on the 8 inch touchscreen, which also flashes the word Sport. At that point, you can also feel the steering resistance tighten. The IVT holds the simulated "gear" range you have chosen when you bump the floor stick backwards for downshifts and forward for upshifts. A large centrally located tachometer redlined at 6500rpm keeps track of your manual shifts. While Kia provides no paddles at the wheel, the floor actuation is just as quick and satisfying as paddle shifting. The new Forte's suspension and wheel/tire combination provides surprisingly well controlled behavior. The 17 inch alloy rims, part of an optional $3,210 "EX Launch Edition," plant 225/45R17 Kumho Majesty Solus radials at each corner. Despite the fact that these mud and snow rated tires carry a super-long wear rating of TW500, they grip the road with tenacious resolve. 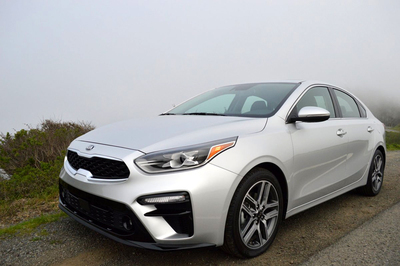 The shock/spring/tire setup Kia has chosen for the Forte EX producers lively, compliant sports sedan handling worthy of German cars costing twice as much. It has become increasingly apparent that South Korean vehicles exceed expectations when it comes to packing expensive technology into inexpensive products. 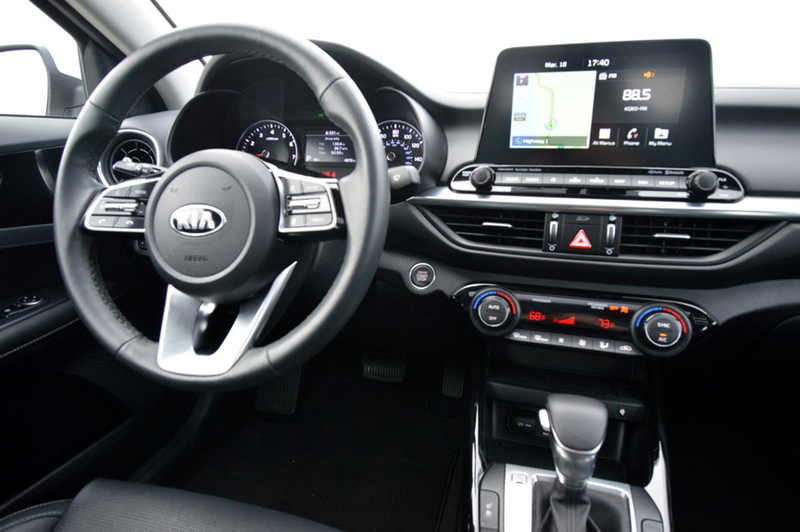 For example, in the "comes standard" department, this diminutive Kia includes the following items European manufacturers love to charge extra for: dual zone automatic climate control, Android Auto and Apple CarPlay smartphone integration, power adjustable driver's seat, push button start, smart key, smart trunk. In addition a large suite of safety features is free of extra charge, with forward collision avoidance, blind spot warning, lane departure warning and rear cross traffic alert all operating unobtrusively to make your road conduct safer than ever. Our test Forte's EX Launch Edition Package added a couple of worthy refinements to the comprehensive basic mix. Navigation tops the list of added inclusions, with a couple of additional safety measures to help you park (rear parking distance warning), travel (smart cruise control), and steer clear of pedestrians (forward collision avoidance-pedestrians). Not only that, but Kia also throws in a rear spoiler, LED headlights and LED interior lights, plus a wireless phone charger. And last but not least, the Launch edition includes those graphite finished, 5 double spoke alloy 17 inch rims. Seems like a lot of pricey extra equipment for just a $3,210 expenditure. If there's a knock on the Forte EX, it would apply to its rather undistinguished interior trim level. Black on black pretty much sums up the look here. While it's not bargain basement cheap, you won't be confusing the Forte's accommodations with more expensive luxury aspirants like Audi and BMW. 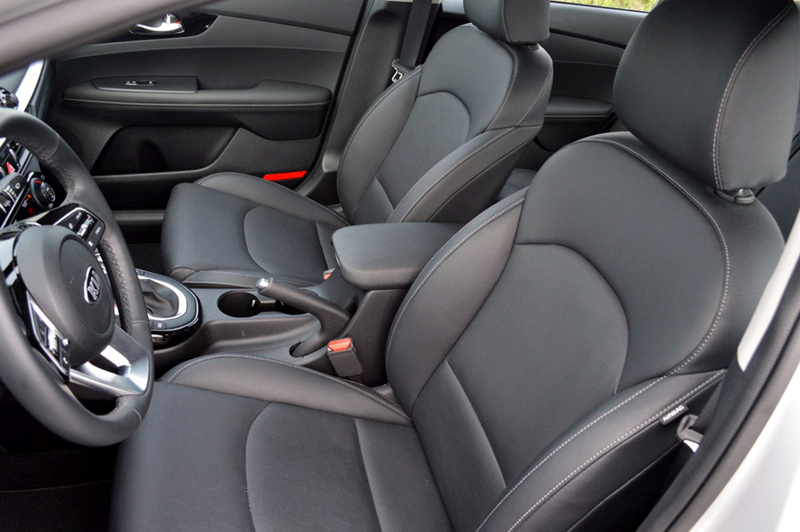 However, if you can accept an understated but eminently serviceable interior as a trade-off for this sedan's incredible bargain price, you will find that the Forte EX offers a delightful mix of small exterior, big interior, small engine, big mileage, and best of all, small price and big value. The Most In-Depth Independent Kia Vehicle Shopper's Research - Anywhere!